The iPhone and iPod Touch have created quite a wave in healthcare, and along with the wave has come a plethora of healthcare applications. The user interface on the iPhone/iPod Touch combined with the ease of accessing applications on Apple’s iTunes store and the relatively inexpensive nature of most applications, have made these devices a favorite among healthcare professionals. With the volume of healthcare related applications available, I’m surprised at how few I actually use. I spend quite a bit of time surfing the app store looking for new applications that I can apply to pharmacy. I’ve downloaded numerous applications, but have deleted most for one reason or another. My “research” has led to the list below of applications that I find most useful as a pharmacist. Lexi-Drugs: No surprise here. I’ve been using Lexi-Comp products for years, and have always found them to be a well designed and informative resource. Their paperback Drug Information Handbook is a mainstay in any hospital pharmacy. EPocrates Rx: I have this on my iPod touch, but don’t use it very often. In fact, I often forget it’s there. I find that EPocrates is popular among physicians, nurses and outpatient pharmacists, while Lexi-Drugs appear to be king of the acute care pharmacy setting. AHFS Essentials: The Essentials iPhone reference is derived from AHFS Drug Information. While the AHFS reference is supposed to be geared toward pharmacists, I’ve never found it that helpful. The one thing I like is the inclusion of off-label uses. Drugs.com: Hey, it’s free and is accessed via the internet. I wouldn’t use it as a primary drug reference, but it might be helpful in a pinch. 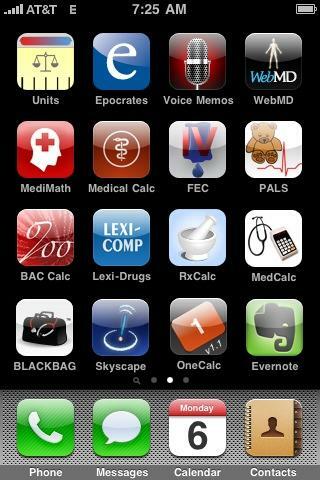 RxCalc: RxCalc is the only pharmacokinetics calculator currently available for the iPhone. It was designed as a tool for pharmacists to perform aminoglycoside and vancomycin kinetics, including new starts using population parameters and dosage adjustments using levels. It does all the basics in a simple to use, straight forward interface. MedCalc: This is a free medical calculator with an extensive list of formulas (http://medcalc.medserver.be/iphone_formulas.html ). It’s been around since the first Palm Pilots were popular. I don’t use it often, but considering the price (Free) it is nice to have. Skyscape: This is a suite a free applications including, RxDrugs, Archimedes Medical Calculator, and Outline in Clinical Medicine. The application also has a nice little feature called MedAlert that gives you timely little notices like drug recall information. I find it useful on occasion. BLACKBAG: This application provides medical news across multiple specialties and therapeutic areas. You select “subscriptions” to the specialties you like to read about and BLACKBAG delivers pertinent information on a daily basis. As I said, these are the applications that I’ve found useful as a pharmacist. If you have a favorite application for the iPhone or iPod touch let me know. I’m always interested in adding stuff to my list. There are hundreds of healthcare related applications in the iTunes App Store and I encourage you to spend some time browsing. Who knows what you’ll find. If you purchase Lexi Complete, it comes with AHFS Essentials. Just thought I would mention it. Thank you for this review. Do you still use all of them? Actually, I don’t use any of them anymore. I no longer carry an iPhone or work in a hospital. Hi Jerry, I’m a fellow pharmacy informatics enthusiast and have recently released my first iPhone app called RxOrange, which is a complete Orange Book solution with a few extra features. Do you combine your passion for pharmacy and informatics these days?